COPD stands for chronic obstructive pulmonary disease. It's a type of lung disease that makes it difficult to breathe, because optimal lung exchange of oxygen and carbon dioxide are interrupted. A variety of medical conditions may be categorized as COPD, including chronic bronchitis, emphysema, or aesthetic bronchitis, just to name a few. If you are looking for the best destination to get stem cell therapy for COPD abroad, then Mexico can be an ideal place for you. 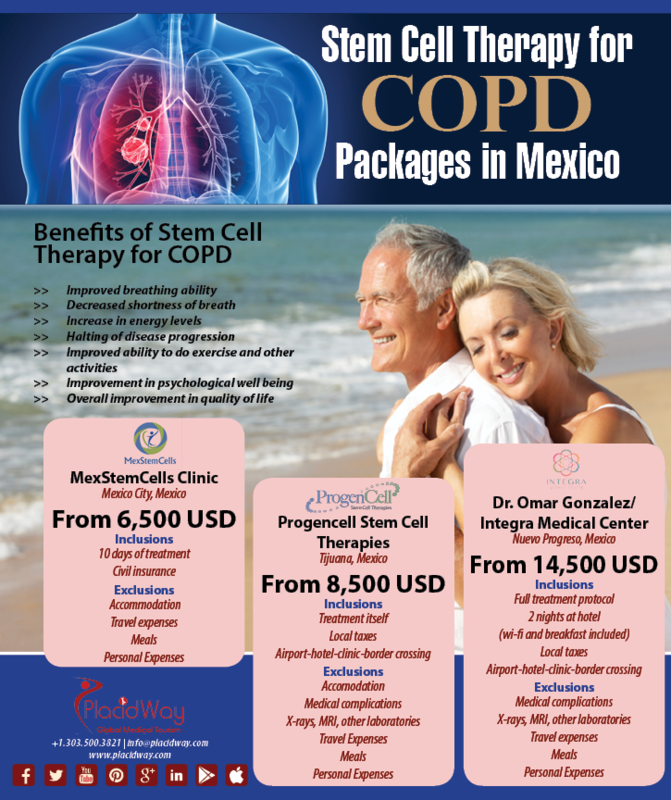 The average price of Stem Cell Therapy for COPD in Mexico is $12,124 approximately. The price ranges from $6,500 to $20,000 approximately depending upon the services and facilities provided by the medical center. Stem cell therapy for COPD is being studied for efficacy in improving the complications in patients through the use of their own stem cells. Adult stem cell treatments for COPD may help patients who don’t respond to typical drug treatment, are looking to try stem cell therapy before starting drug treatment or want to reduce their reliance on medication. The stem cells have the potential to replace countless cells of the body, lung tissue included. These stem cells may heal the body by replacing the ones that are plagued with disease, regenerating new cells, and suppressing the immune system's macrophage response which engulf and digest the dying cells of the lungs. Stem Cell Therapy for COPD can lead to an increase in oxygen levels and helping patients feel less fatigued. This treatment has the potential to change lives and make living with COPD more bearable.